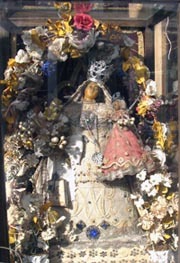 18th century dress for the Christ Child of the miraculous ‘Our Lady of Antwerp’ in the cathedral of Antwerp. Feb. 2009. Typical 19th century Flemish dressed wax ensemble under glass, surrounded by artificial flowers etc. Dressing up the Virgin Mary and the Christ Child and decorate in this ay have often been a devotional practice for women, where various kinds of needlework and treatment of fabrics were demonstrated and put to good use. Feb. 2007. 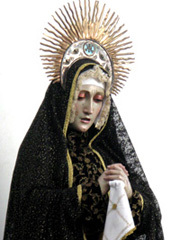 20th century black dress for the Mater Dolorosa in the old mission church in Ciudad Juarez, Mexico. Sept. 2007. 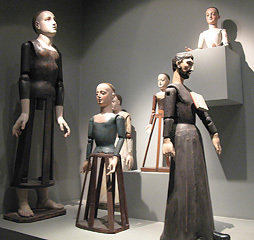 Set of 17th century dressing sculptures in Museu São Roche in Lisboa with moveable limbs to make it easier to dress them. Most often they have no carved hair, since the heads were meant to wear wigs of human hair. Oct. 2013. Den Pelgrim van Halle ofte Historie van onse lieve Vrouwe van Halle: dat is: Den oorspronck van het H. Beeldt; beneffens de mirakelen ofte besondere jonsten; als oock de eere ende giften aen de H. Maghet bewesen / ghemaeckt, Brussel: Huybrech Antoon Velpius, 1657. Approbation of the manuscript was received the year before. The author had examined the existing lists of donations offered to the black Madonna, and therefore he was able to offer an extensive account of these offerings. Villages, cities, confraternities, noble families and princes, all had donated various items to Our Lady of Halle. Thus, we read that a confraternity in Brussels in 1638 had donated a magnificent cape, another in the village of Hoy a golden dress in 1646, nevertheless topped by the confraternity in Valencyn which donated not only a cape more splendid than the other confraternities, but also a huge wax candle from which ‘waer oock een schildeken is aen-ghehangen, af-beeldende de H. Maget, ende de stadt Valencyns wapen’, and in addition ‘draghen stockens met een papieren beeldeken van onse lieve Vrouwe’ (p. 151). 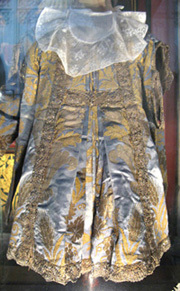 In 1615 Albert of Austria had donated a silver cape, and ten years later a dress with perls, and shortly before Fr. Poirters read the list, a confraternity in Dinant had donated a white dress with fine embroidery. As dressing became usual, sculptures were made accordingly, almost like stands with only those features detailed which would actually be visible, like heads and hands. In the museum of former Jesuit church São Roche in Lisboa, a number of such stands or racks have been preserved. The growing interest in realism resulted in sculptures with wigs and actual textile dresses. Even though the dresses may be documented at least back to the early 17th century, it seems that the custom of dressing the sculptures was established already in the Middle Ages. In the German monastery of Wienhausen north of Hannover, such medieval textiles are still preserved. With time they may simply have been worn to threads and was thrown out – or reused in various ways for palls, chalice veil, burses etc. Since their purpose was to decorate the sculptures, a too worn state would be counterproductive. Hence, most of the textiles preserved today go back no further than the 18th century.